The Prince’s Terrace is a residential apartment building being constructed in Adelaide as part of a unique collaboration between The Prince's Charities Australia, Renewal SA and Defence Housing Australia (DHA). Being built using sustainable building techniques based on strict Green Building Council of Australia guidelines, the ambitious project aims to set a new benchmark in environmentally sustainable design, as it targets Australia's first Six Star, Green Star rating for a residential apartment building. 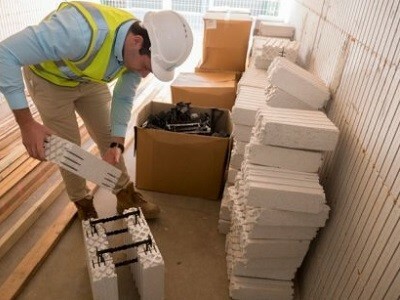 On completion, the apartments are expected to use 50 per cent less energy and potable water than a typical urban townhouse, and will boast of a carbon footprint that’s reduced by more than 40 per cent in comparison with a standard household. All the materials being used in the construction are environmentally sustainable with local sourcing prioritised to reduce the carbon footprint. FireFORM Insulated Concrete Formwork from ZEGO Building Systems was specified for the project for its superior insulation and structural integrity. Palumbo Building Group of Adelaide was awarded the prestigious contract for this unique project. A key challenge for the builder has been to find tradesmen experienced in working with the new products. Some of the energy efficiency features in the build include the use of foam block, slurry concrete walls and double-glazed windows to double the apartments' insulation levels compared to a regular brick construction; and roof ventilators, wall grills and ceiling fans to reduce air conditioner and heater use. Water-efficient fixtures, and environment-friendly plasterboard, carpets, doors and hardware are some of the other green features included in the project. Waste management is an important aspect of the entire construction process with steel and concrete waste being recycled completely, and overall recycling of building waste maintained at a very healthy 97 per cent.